Eight out of every ten prescriptions dispensed in the U.S. are for generic drugs. Between 2003 and 2012, the generic pharmaceutical industry generated more than $1.2 trillion in savings to the health care system. Expectations are that the use of generics will intensify over the next years as important brand-name drugs go off patent. Generic companies have stepped up their R&D expenses, questioning the once well-established notion that innovation was the domain of originator companies. In recent years, the distinction between innovators, or research-based originator companies, and generic copiers has become blurrier, as a growing number of generics manufacturers engage in important innovative efforts. The International Federation of Pharmaceutical Manufacturers and Associations estimates the cost of developing one single drug at around $1.3 billion, a ten-fold increase from 1975, when such cost was $138 million. The pharmaceutical industry faces a myriad of technical, regulatory, and economic challenges. Pharmaceutical R&D is characterized by a remarkably high R&D failure rate; meaning that expenditures often do not materialize in market-approved medicines. In addition, lower reimbursement rates and generics competition have also stood in the way of profitability. Consequently, important drug companies have reduced their previously large and centralized R&D budgets. A recent study showed that the U.S. share of global biopharmaceutical industry R&D expenditure has fallen from 50.4% in 2007 to 42.3% in 2012, a decline of $12.9 billion in industry’s investment in R&D. This decline was caused almost entirely by decreased investments from corporate agents and not by cuts in public spending. Over the past five years, major companies like Pfizer, AstraZeneca, and Merck have scaled back their R&D expenditures. While this reduction in spending can bring higher short-term returns, the consequent shrinking pipelines will have long-term negative consequences. With the object of saving $2.5 billion annually, Merck recently announced its plan of reducing its staff by 20%, closing offices in New Jersey, and discontinuing some late-stage drug development. Similarly, Pfizer’s R&D expenses dropped from $9.13 billion in 2010 to $6.68 billion in 2013, from 17.21% to 15.78% of gross profit, which is largely explained by the company’s withdrawal from cardiovascular drug research. Eli Lilly, which for years refused to follow its competitors into pulling back on R&D expenses, has recently announced a cut of up to $1 billion. The company experienced a 20% increase in R&D expenses between 2009 and 2012, reaching an estimated $5.4 billion in 2013. However, its plans for 2014 include limiting spending to around $4.4 billion. Such cuts have direct effect over patients, whose chances of having access to new drugs become increasingly unlikely, particularly when it comes to diseases like diabetes, Alzheimer’s, cancer, etc. Various companies are suspending research efforts in key areas, such as antibacterials, depression, schizophrenia, and AIDS. Recent trends have forced pharma companies to seek more effective alternatives wherever they can. As a result, various companies have migrated towards areas with available skilled labor and areas in proximity to leading universities and research institutions, such as Cambridge, MA. While big pharmaceutical companies scale back their R&D efforts, the risk of innovation is increasingly absorbed by small biotechnology startups. These young companies, often populated with former pharmaceutical employees, have shown great promise in cutting-edge efforts, particularly in the domain of genetically targeted medicines. 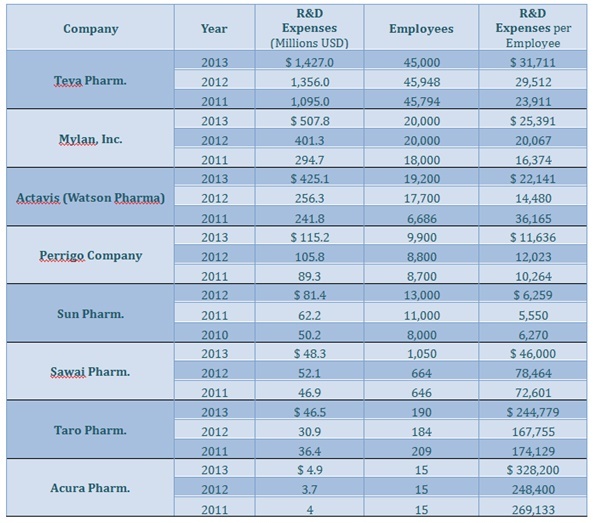 Contrary to major brand-name drug companies, generics manufacturers have increased R&D expenses. The following table demonstrates this upward trend. NOTE: Per capita R&D expenses concern multiple R&D efforts, including those related to generic medicines. The FDA defines generic drug as “a drug product that is comparable to a brand/reference listed drug product in dosage form, strength, route of administration, quality and performance characteristics, and intended use.” The price of generics is, on average, 80 to 85 percent lower than brand-name drugs. 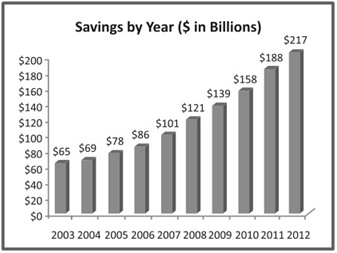 As a result, savings generated by the use of generics are massive, having reached $217 billion in 2012. Generic drugs already represent 80% of drug sales in the U.S., a number expected to rise as major brand-name drugs go off patent. 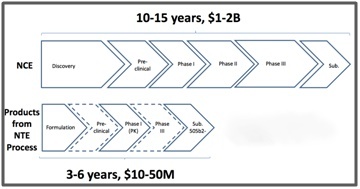 The period between 2011 and 2016 has been referred to as a “patent cliff”, as over 300 drugs that generated $400 billion in 2010 become open to the generics industry. And the increasing adoption of evergreening strategies by originators. In this very competitive scenario, generic companies must constantly look for new ways to improve product profitability. In other words, innovative competitive strategies that reduce costs and increase efficiencies are crucial to maintaining generics profit margins. The following sections present three categories of generics innovation. The second and third sections were based on the article "The generic pharmaceutical industry: moving beyond incremental innovation towards re-innovation", which appeared in the Generics and Biosimilars Initiative Journal (for more information please refer to citation 8). Process innovation is crucial to the generics industry. While performance enhancements ensure competitive advantage in a generally low margin market, safety improvements are key to survival in a strictly regulated environment. In spite of generics’ growing popularity, safety remains a significant concern. In 2012, a survey by the Consumer Reports National Research Center revealed that 43% of those polled had persistent misgivings when it came to generic drugs. Among those questioned by researchers at Brigham and Women’s Hospital in Boston, only 38% said they preferred generics to branded drugs – even though more than 50% believed Americans should be taking more of them. In addition to a not unusual suspicion that generics are somehow subpar, there is a growing concern about ever-more rigid regulations. A recently proposed FDA rule aims to allow generic manufacturers to update safety labels independently, in order to report newly found risks. As of right now, the labeling of a generic medicine is the same as the one previously approved for its branded counterpart. Consequently, because generic companies do not control labeling, they cannot be held accountable for negligence in warning new dangers. Greatly supported by consumer advocate groups, the new regulation will bring unprecedented liability to generic drug makers in case their products harm patients, exposing the generics industry to lawsuits. For this reason, significant R&D investments will be necessary to fully analyze the risk profile of each and every pharmaceutical product commercially available. Since its emergence, the generics industry has relied on incremental innovation, which translates into adjustments to off-patent, brand-name drugs. Examples of incremental innovation include enhancing delivery systems, developing alternative dosages, and finding solutions to patient compliance issues. Generic manufacturers’ understanding of patient and pharmacists needs have led to innovative solutions that help patients and reduce dispensing errors. Headquartered in Canonsburg, PA, Mylan, Inc. has developed innovative packaging and dispensing systems that improve efficiency, avoid dosing errors, and promote patient safety. Examples include a line of highly accurate injectables, such as the industry-first Octreotide Acetate prefilled syringe; the only ready-to-administer bag of Levetiracetam in sodium chloride injection; a wide line of ampules to meet varying needs of different institutions; and various packaging solutions that help monitor inventory and encourage patient compliance, such as the Control-A-Dose Packaging and the Patient Compliance Pack. In addition, Mylan has designed, developed, and manufactured innovative transdermal drug-delivery systems. The company was the first to receive approval for generic nitroglycerin, estradiol, and fentanyl transdermal patches. It also created Medifilm, a line of extruded and co-extruded films designed to meet the specific requirements of wound care, ostomy, and transdermal applications. Also an example of incremental innovation, generic companies have developed fixed combinations of commonly co-prescribed medicines, such as diuretic/potassium conserving and non-steroidal/proton pump inhibitor. These novel presentations have greatly contributed to patient compliance. 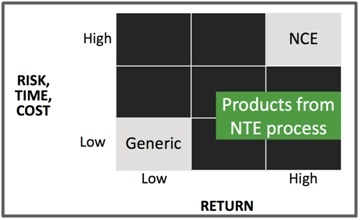 In the pursuit of competitive advantage, various generic companies have adopted a re-innovation model, where they build upon a product’s early success by improving them and integrating revised and refined features with the objective of providing more personalized, cost-effective solutions. A number of companies are investing in new product portfolios consisting of “super generics”, enhanced versions of off-patent branded drugs. The ultimate goal is to conquer a greater share of the market through increased quality and efficiency combined with fewer risks, side effects, and toxicity. Also known as value-added generics, hybrid generics, or new therapeutic entities (NTE), these innovative formulations require significant scientific and technical capacity. The development of value added generics often involves the use of new technology platforms, such as the application of nanoparticle technology to increase efficiency in the delivery of poorly soluble compounds. Fereshteh Barei et al. provide us with an interesting list of super generics. The list of super generics is extensive and growing. A few illustrative examples include new drugs that can avoid previously verified hypersensitivity, such as Abraxane, the super generic form of chemotherapy drug Taxol; drugs that offer more predictable clinical responses, such is the case of Subacap, an improved version of antifungal itraconazole formulation; and per oral versions of drugs that were previously only suitable for intravenous administration. The same article points out that a growing number of generic drug makers are implementing re-innovation strategies and therefore transforming the very nature of competition in the generics industry from price-focused into quality-focused. New therapeutic entities are at the heart of Teva Pharmaceuticals’ R&D strategy. America’s largest generic drug manufacturer and provider of one in every six prescription drugs in the country has used the NTE process to create new specialty products that 1) address unmet patient needs; 2) are based on known molecules; and 3) are formulated, delivered, or used in novel ways. The report also illustrates the attractiveness of super generics in comparison to generics and NCE. Re-innovation is also translated into a new focus on biosimilars, subsequent versions of brand-name biological drugs. Different from chemical drugs, biologics are not easily replicated. In fact, it is practically impossible to make exact duplicates. For this reason, they require significant R&D investments aimed at assuring patient safety and receiving necessary FDA approvals. In addition to representing a major opportunity for the generics industry, biosimilars can bring significant savings in health care expenses. Express Scripts estimates that the U.S. would save $250 billion between 2014 and 2024 if just a handful of biosimilars were to enter the market. Important patents will continue to expire through 2018, providing generics companies with a significant pipeline for the near future. After that, however, competition should get tougher in the generics industry. Generic drug makers should take advantage of federal R&D tax credits as they turn towards innovation to ensure their long-term viability.